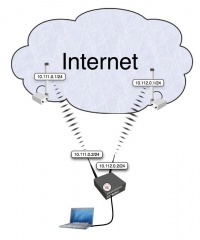 router punya 2 upstream (WAN) interfaces dengan ip address 10.111.0.2/24 and 10.112.0.2/24. dan interface LAN dengan nama interface "Local" dan ip address 192.168.0.1/24. disabled=no comment="gateway for the router itself"